There are many ways to keep warm on a nice summer’s evening when you’re out in the garden. 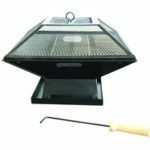 One method which requires little upfront cost can buy you even one of the best garden fire pits. Lower end outdoor fire pits can be bought for even cheaper. Similar to outdoor chimineas, real fire is used to keep warm which can be really comforting and relaxing. 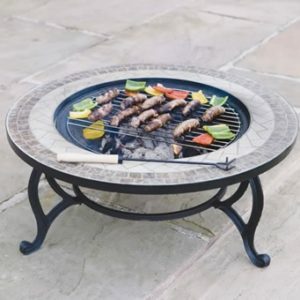 Most portable fire pits will also allow you to grill food, so if you’re only having a small bite, no need to get the charcoal barbecue out, just chuck it on the fire pit grill! 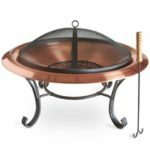 Since a fire pit bowl is only a fraction of the size of a chiminea, storing it away when it’s not in use won’t be an issue, it’s even small enough to fit inside an outdoor storage box. Alternatively, an electric or gas patio heater will probably provide more heat, but it won’t have the same calming effect a fire would. As well as providing that comforting warmth, most will also double up as a BBQ grill and it can also add a unique style to your garden. 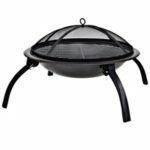 Below we’ll guide you through the list of features and what to look out for, so it will be easier for you to pick out the best garden fire pit. Material – Despite most being made from steel, the style and look can still vary from one model to another as the bowl can be made from a different material such as copper. Cooking grill – If the warmth from the fire isn’t enough to warm you up then perhaps some hot food on the grill might do the trick. 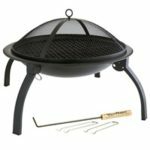 Mesh lid – Protects you from any sparks that might fly out but can be removed if you prefer to enjoy the fire without any obstruction. 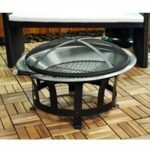 Folding legs – A folding garden fire pit is ideal for those who might lack storage space, but once the legs are folded in, it becomes even more space efficient and portable. As a result, it’s also ideal for trips away such as for camping or fishing. Suitable for – What can be used to start up the fire. Extras – Any additional items that are included. Some include a carry bag which is really handy for carrying around your portable fire pit. Dimensions – Finding a place to put the fire pit should be quite straightforward as it doesn’t take up much space. 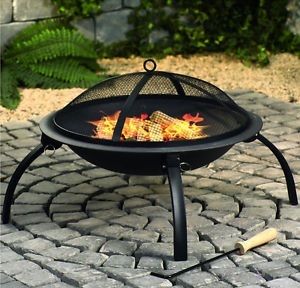 If you only have limited storage space for when it’s not in use, then consider a garden fire pit with folding legs. Weight – Generally very light and portable so easy to take it away on trips. A coffee table and fire pit merged together. This won’t replace a garden picnic table but it’s for putting items such as a bottle of wine and wine glasses on the table as usually the rim around the fire pit is quite small. Be aware that you shouldn’t be using the fire pit table to eat your food as this can be dangerous since you’ll be too close to the flames. A safer option where the flame and heat can be controlled to your liking. 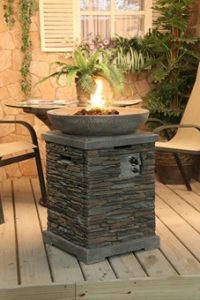 It might not give the same camp fire experience a typical wood burning fire pit would, but you add lava rocks which beautifully compliments the flames. Gas fire pits come in many different stunning designs which will no doubt be the focal point of your garden. However, it does also attract a much higher price tag than your standard backyard fire pit.